Sit back and relax at Sandy Bottoms, a sunny beach home nestled in the sand dunes on the southern end of Topsail Island. 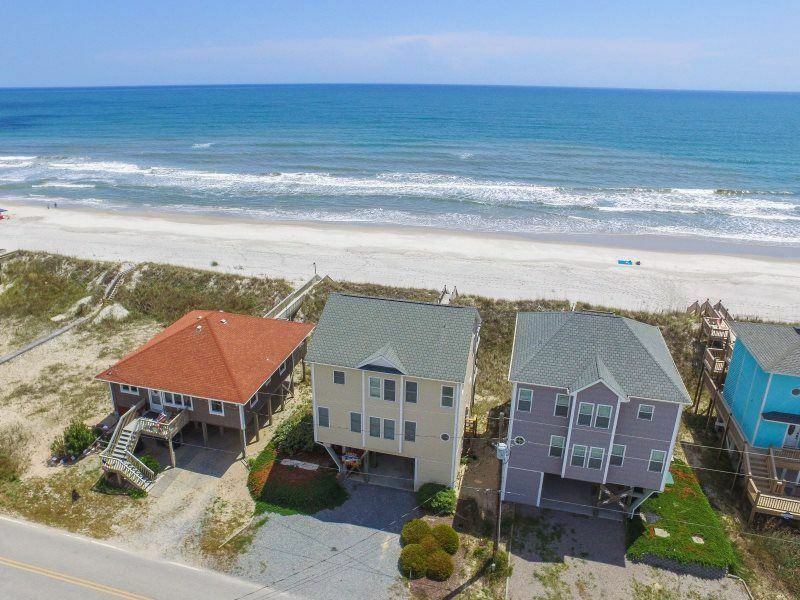 This oceanfront vacation home is located on the quiet and uncrowded beaches of Topsail Beach, not far from shopping, dining, and fishing piers. This house features a classic kitchen, fully-stocked for all your cooking needs! There’s plenty of space to store groceries for the whole family, and you’ll love that you have room for a couple cooks in the kitchen. Sit at the kitchen island and enjoy a quick bite or some conversation, or bring your plate to the table outside and watch the ocean waves roll in. There’s also room for meals at the dining table, which seats six. The cozy coastal living room has plenty of room for entertaining or just enjoying some quality family time. The living room has a gas fireplace to keep you warm over the off season, and a large flat screen TV for watching movies. The house is stocked with a variety of books, puzzles, and board games, to keep the family busy on rainy days! The master bedroom features a king bed, with its own private bath and sliding glass doors to the covered deck. You’ll love the natural light that filters in through the doors and the gorgeous views of the ocean you can enjoy, rain or shine. Next door, you’ll find another spacious king guest room that also has access to the covered deck through sliding glass doors. The last bedroom sleeps three, with a queen and a twin bed in a fun nautical theme. On the top floor, you’ll find a cozy queen bedroom with a full bathroom, perfect for a catnap after a long day at the beach. This bedroom has a private access, through a pair of sliding glass doors, to the sundeck. This oceanfront home has terrific views from the two long decks facing the beach. Several bedrooms have private deck access, but everyone can enjoy the views from the top deck from one of the many outdoor chairs. This house also includes a private beach access. Your beach chairs, coolers, games and boards will store nicely in your private locked storage area, and the outside shower area has both hot and cold water. The carport under the house has space for 2-3 vehicle, with room for more in the drive. This house rents from Sunday to Sunday during the summer. Approximately 7.2 miles south of the Surf City traffic light. Please note: linen fees vary by property and will be collected upon check in..
Jun 16 2019 - Aug 17 2019 : Sunday check-in required. Sunday check-out required.